COLUMBIA - Christmas is nearing and there are still local families in need. 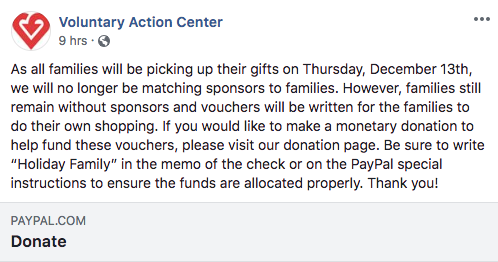 Voluntary Action Center is asking for more sponsors to donate to families who need help with Christmas this year. VAC has been accepting gifts and donations all week, and is planning to distribute them to several hundred families Thursday. It posted on its facebook page saying some families are still in need of sponsors. According to the VAC, gifts consist of everything from children's clothing, to toys, bicycles, hygiene products and basic household items. To donate, visit VAC's donation page.